Susan Carter has her hands full with her twin daughters and running the Galilee Women's Shelter. Gabriel Dawson is the new pastor and she intrigues him. She just wants his help in solving the neighborhood problem of drugs and abuse. Can she interest him in the center without getting involved herself? Susan Carter runs the Galilee Woman's Shelter and is raising her twin girls, Hannah & Sarah, on her own.Gabriel Dawson is Pastor of Good Shepherd Community Church. He has done much in his 9 months to be community minded but not on the East side of his community, where the shelter is.Every Mama and Grandma in his church has tried to push their single woman on him but he finds his heart only reacts to Susan.This story opened my eyes to battered women and children. 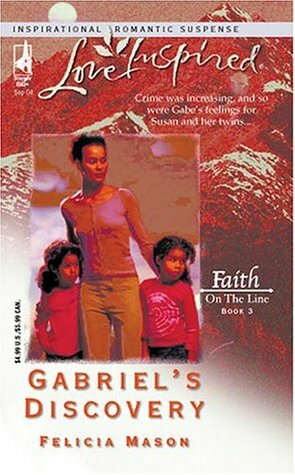 I never thought about being in a situation like that or how hard it must be for them to find a way out.Great part of the Faith on the Line series (book 3) but also very informative on its own.Thanks Felicia! This was the first book I read by Felicia Mason. I loved Susan's character. I thought Susan was very strong & brave for what she did for the other women. I love Susan's daughters I thought they were so cute & adorable. This was a nice, lovely story to read. Thank you auntie for introducing my to this story & this author. The book inspires a lot about how a Christian must be a compassionate being to those who need most of our time and attention, specially in our community. Great reading. Kudos! This is part of a series and I read the Faith On the Line, Book 3. Decent addition to the Faith on the Line series, but not as much romantic suspense as others in the series. Love these Faith on the Line books. Shows Christians as they should be. Certainly not perfect but definitely forgiven. Insight to women's shelter activity. A love story by a man of God. Easy read back to basics.